Weight: 0.50 ct; size: 6.00 | 4.13 | 2.96 mm; shape: oval; colour: medium light strongly purplish red; very slightly brownish; clarity: eye clean; cut: very good; treatment: none. Very clean specimen; very good mixed style cut. A primary mineral in hydrothermal veins; in metamorphic deposits; common in carbonatites; authigenic and secondary in sediments; uncommon in granite pegmatites (Anthony et al., 2001—2005). 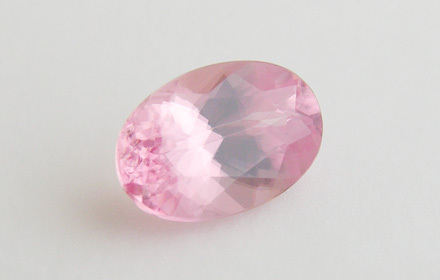 Faceted specimens are rare. The largest faceted specimen is a 59.65 carat from South Africa (Arem, 1987: 162).